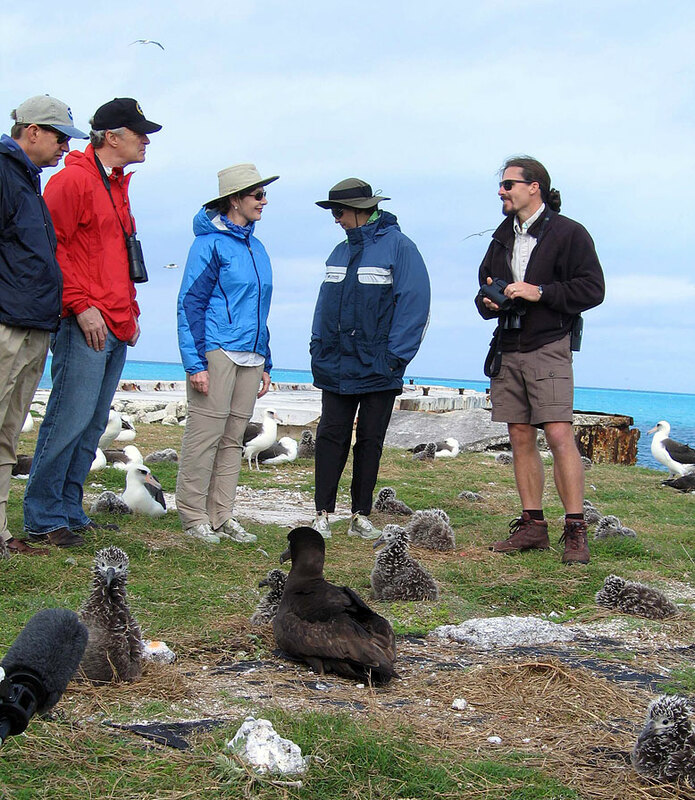 MIDWAY ATOLL » First lady Laura Bush didn't just look at the wildlife of the Northwestern Hawaiian Islands on her whirlwind visit here yesterday -- she interacted with it. Bush fed fish to a young endangered Hawaiian monk seal, one of six being fattened in an enclosure to increase their survival chances when re-released to the wild. 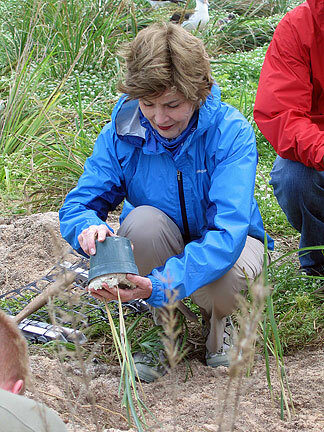 She planted native bunch grass to improve the habitat for endangered Laysan ducks, which have been reintroduced here and are thriving. And she shook her head in dismay when she saw how much plastic debris makes its way to this remote portion of the Hawaiian Archipelago, thousands of miles from any continent. "People do need to know that if you drop your cigarette lighter in the gutter, it's likely to wash out and finally end up in an ocean and, in this case, end up in the stomach of a baby chick albatross," Bush said. "And I know people aren't that aware of this, and I think if they were aware, they'd be a little bit more careful." Bush was emphatic about the importance of the Northwestern Hawaiian Islands Marine National Monument, proclaimed by President Bush in June. Today, Laura Bush is to participate in a ceremony bestowing a native Hawaiian name on the monument. "This is very, very important," she said, noting that "the monument doubles our acreage that's under -- maybe I should say mileage -- that's under the Department of Interior or the Department of Commerce. It is now the largest conservation area in the United States, and the largest marine conservation area in the world. So it's huge." Bush walked and rode in golf carts around the two largest islands in Midway Atoll, Sand and Eastern, learning about the bird and marine life that flourishes here and the historic battle that turned the tide for the U.S. in the Pacific during World War II. In an exclusive interview with the Star-Bulletin, she said she supports funding for the monument that will preserve both its unique wildlife and cultural and its historical heritage. Bush spoke in favor of speeding the cleanup of lead paint that is poisoning some birds when they eat chips of paint from old Navy buildings. The U.S. Fish and Wildlife Service has estimated that the work will cost $6 million but has not been budgeted. Bush said she believes a limited amount of eco-tourism could be good for the islands by spreading the wonder of being here. "It's a really huge thrill to have this opportunity," she said. "I mean, this is what we were all calling, including our Secret Service (agents), a once-in-a-lifetime" experience. "Well, it's so remote, I guess there never would be -- I hope there never would be -- any large amount of tourism here," she said over a morning coffee at the island's restaurant before starting on her tour. She also said she supports scientific research in the area, to learn more about it. "I think it's interesting for scientists and researchers to be able to come here and to really learn how -- what we can do to manage conservation and to protect this area in the best way we possibly can," she said. Bush said she has been an avid bird-watcher all her life, but she does not keep a checklist of birds she has seen, as some birders do. 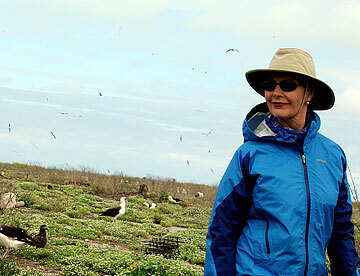 She noted that she had never before seen any of the three albatrosses she saw yesterday: the Laysan albatross, the rarer black-footed albatross and the only golden albatross in the country. Asked if she had volunteered to make this trip, Bush did not hesitate in answering, "Absolutely."